I didn’t actually quite get what Marco meant when he said that some words are too hard to speak out they tangle themselves in your throat in an almost choking manner. It’s probably him exaggerating things again as he often did. He loved taking things up a few notches than what they actually are. Like how one time, when we were huddled in our favorite spot in a corner table at Starbucks, he insisted that it was my new hair color— ash gray— that was giving him a headache. I thought he meant it figuratively. But he then proceeded to explaining how the color hurts his eyes, that the pain travels through some nerves and manifested on his head. I mean, how can a mere hair color give someone a headache? How can words choke you? He turned out the light and a hundred or so glow-in-the-dark stars in the ceiling subtly lit his room, emanating a soft, greenish light. In the darkness, I smiled, because I know he wanted me to see this. I scanned the sky— the ceiling— looking for the meteor shower he’d promised me earlier that we’d watch together. We lied there side by side in the dark, silent, as if waiting for the shooting stars, those fleeting flash amid the myriad of dots. But of course, they never came. “There’s one!” I said, pointlessly pointing to a certain patch in our artificial night sky. “There’s another one!” He laughed. For a moment, I wanted to believe it’s true. I wanted to believe that nothing went wrong between us. But I knew better now. We were no longer those same people from the past. We broke and we fell apart, our night sky exploding. “I made this for you.” He said. I did not say anything. We just laid there in the darkness, holding each other until he fell asleep, and I once again allowed myself to cry silently, for the chances I didn’t take, the choices I didn’t make, for the love that I lost. “I’ve missed you,” I said in a broken whisper, and when I thought that he’s already asleep, he stirred. He searched for my face in the darkness, and planted a kiss on my forehead, on my nose. I snuggled closer to him, pretending that in that moment, the stars in the ceiling weren’t tearing me apart, that I wasn’t breaking apart, that I wasn’t aching with the thought that I cannot have him again. 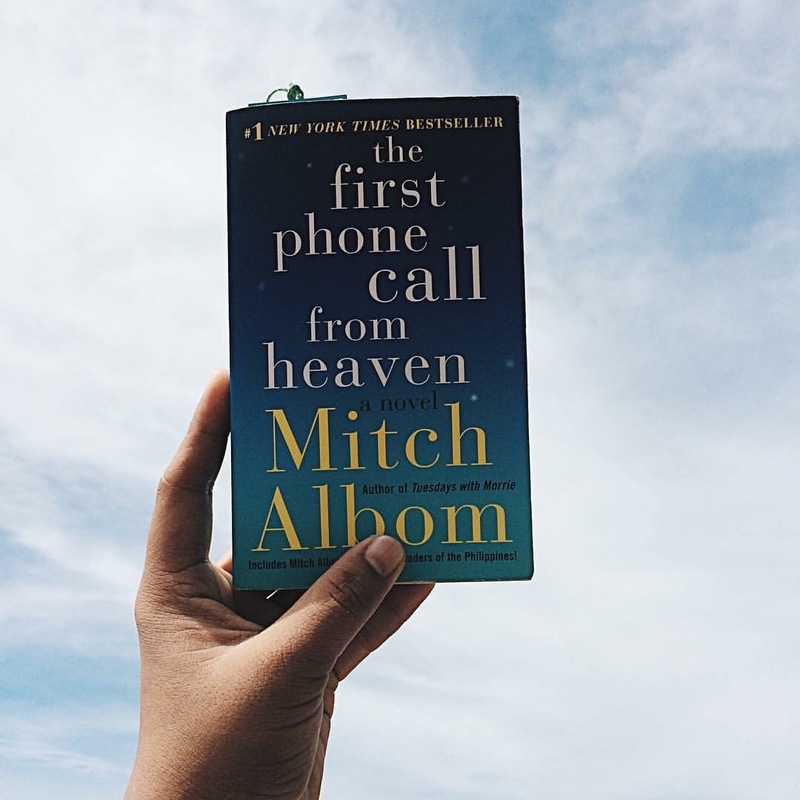 The First Phone Call from Heaven tells the story of a small town, Coldwater, in Michigan that gets worldwide attention after seven people have claimed to be receiving phone calls from their departed loved ones giving them reassuring messages about the afterlife and giving them words of encouragement to go on living their lives. It is penned to be one of the greatest miracles that has ever happened in their town or perhaps the world. Is it real or is it a hoax? While everyone in town believes to have witnessed a rare miracle in town, Sully Harding, a grieving husband fresh out from jail for a crime he did not commit, thinks so otherwise. He believes that these miracles are just a fraud played by someone in town and tries to prove to his son (and more to himself) that miracles are not true and these phone calls from heaven are just man-made. I can no longer remember who fell asleep first. All I remember was how I laid there, burying my face into him, taking him in, everything about him— his warmth, his scent, the feel of his shirt on my face. I remember how he wrapped me in his arms, cautiously, as if I was a fragile butterfly which, in a way, I was. I remember his fingers gently stroking the back of my head, entangling with my hair that was beginning to feel sweaty. “Everything’s going to be okay.” He whispered. I didn’t say anything. I just stayed still, sobbing, my chest heaving with the effort of not letting a sound of hurt and despair out from my mouth. I just nestled into him, my tears flowing fast and silent, cascading in a perfect stealth. I clung into him in what seemed to be my last gesture of holding on, of fighting for us, for the love I had always believed to be true. He didn’t answer. But I knew he heard me because his stroking had stopped, and he held me into him closer, tighter, and by then he was crying, too. We stayed like that for minutes, hours, I could not remember anymore. We were silent and just let the open air hung awkwardly around us because what else was there to say? I can no longer remember who fell asleep first. All I remember was when I woke up, he was no longer there. I was left with a pillow wet from the tears we cried in the night, and a sheet that had turned cold in his absence. And for all the memories we shared together, that was what lasted in my mind. That was how I remember us— two broken things, one was holding on, while the other was already letting go. Ours was a kind of love that many people will never understand. We did not fit with others’ definition of love. They might call us “crazy” and “delusional”, and maybe we really are, but what we shared was the realest and truest experience I ever had. You were the reason why I stopped reading and chose to reside in the real world because it’s finally happier than in the books. You were the reason why I write even more because you filled me with so many beautiful words. You were the reason why I stayed up late at night because talking to you is far more desirable than getting enough sleep. You were the reason why I took all those risks because you’re worth it. You were always there for me. You became a friend. You were there to listen to all of my thoughts and to snap at me when I begin to overthink. You were always there to listen to me cry when I have problems. You were always there to remind me what’s the right thing to do whenever I got confused. You have accepted me, and loved me even in my difficult times. You were there in almost every moment of my life. You became a part of me. You often told me how we would never really be together in the end. While that thought greatly distressed me, I know that it’s the truth. No matter what, there will come a time in the future when I am going to lose you. You have a whole beautiful life waiting ahead of you. You deserve more than what I can offer you. You deserve to have your own family which I cannot give you. I cannot take that away from you. I often imagine what kind of life would that be, and what I see deeply saddens me. Because no matter how many times I tell myself that we were never meant to be together, I still wished that it’s going to be me and you in the end. Then came a time when you finally left me. I wasn’t prepared to let you go. Not yet. It sure feels like I was dying. And I couldn’t just die. Not yet. So I ran after you. I chase you. I practically begged you to come back. I pleaded to you. And sure enough, you did come back. But you weren’t the same anymore. We weren’t the same anymore. We were no longer the same people. You made me feel like you don’t want me anymore, that you don’t love me anymore. There was never a week that we weren’t fighting. There was never a week that I wasn’t crying. There was never a week that we won’t break up. Honestly, I lost count how many time we broke up with each other, and got back together. I wondered what made you change. Was I not enough? Did I love you too much you were scared? My love for you was an ocean, and you never know how to swim. You were afraid of drowning in it. So you left and it is I who drowned in my own ocean of love for you. When you left, I was never the same. It feels like it’s not you I have said goodbye to, but a part of myself. You were a part of me. And without you, I am not me anymore. And that’s when I knew that I love you— truly, deeply, completely, honestly. I still clung to that meager hope that someday, you will come back for me. I hope someday you will remember me, and the meaning I once held in your life. But right now, you were a poison to my heart, and I am chaos to your mind. I have learned so much from us. I learned that love will never leave you hanging. Love will never make you feel inadequate. Love will never leave you doubting. Love will never have to come back for you because love will never leave you. Love will never ask you to beg for time or attention because love will give it to you freely and whole-heartedly because love knows that you deserve it and that you deserve nothing less. I may not have enough courage to tell the whole world what I felt for you, how much I love you, but I can write how much you mean to me. You will always be the name I will whisper to the moon, as it reminds me of you— so beautiful and so far away. You will always be the love I will think of when I see a shooting star, and wishing that someday, when I see you again, my heart will finally learn how to love you even if you will not feel the same way for me again. Until then, I can only wish you happiness. I wish that you would always be happy wherever you are, my love, my king. I hope you are wishing the same for me, too.